When growing plants indoors, replicating the effect of sunlight is often the biggest hurdle. Sodium, fluorescent, and HID lamps emit too much heat, and are very power hungry. Modern LEDs are superior in these two aspects. 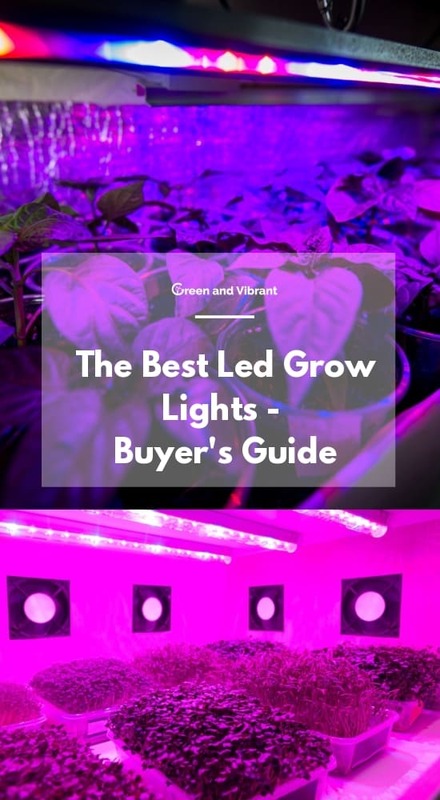 Check out our review list and the buying guide to learn how the best LED grow lights can improve your hydroponics/aquaponics system. What are the factors to consider while shopping for LED grow lights? 1. What are you growing? Depending on their species and variety, plants have varying light requirements. Generally, full-spectrum light is essential for photosynthesis. But even for this purpose, blue and red lights seem to be most important. And plants from dry, sunny areas like the Mediterranean will need more intense light than those originating from sub-tropical or temperate regions. Low-light plants like lettuce and herbs will need 25 watts per square feet, while high light plants like tomatoes will need at least 50 watts. These are just ball-park figures. Different varieties will have their unique requirements. 2. How large is your indoor grow project? This pretty much self-explanatory. The larger your grow area, the more LED bulbs or panels you will require. 3. What type of LEDs do you need? There are two options: full spectrum lights, and separate vegging and blooming lights. Full spectrum lights are all-around products that can provide adequate lighting for a plant throughout its life cycles. But in some situations, you might be opting for a more focused approach. For example, your system may be having separate growing areas for the growing period and flowering periods. In such conditions, you can opt for a vegging LED light for the growth stage, and blooming LEDs for the flowering stage. Many good quality full spectrum lights these days come with programmable settings. With these, you can opt for veg or blooming light settings depending on the age of your plant. What are some good features to look for in LED grow lights? If buying full spectrum LEDs, get one with adjustable output spectrum settings. If you are opting for high powered LEDs, always make sure that they have proper cooling systems (heat sink & fans on the circuit board). Again for higher power systems, ensure that the circuit board is MCPCB (metal core printed circuit board). Look for LED fixtures that have a constant current driver circuit to ensure proper supply of direct current at all times. The VIPARSPECTRA LED is available in two variants, a basic version with reflector, and an advanced dimmable system. And this is a full spectrum LED panel, with varying wavelengths. The entire set covers the whole spectrum, from IR to red and blue lights. A very useful feature in this system is the ability to daisy-chain multiple panels together without using many power outlets. As a higher watt panel, the VIPARSPECTRA LED has a cooling system with fans and an aluminum heat sink built into it. The LED panels perform as expected, according to overwhelming user feedback online. They generate very little heat, and provide adequate and balanced light, for both veg and bloom stage. Like the Viparspecta, MARS HYDRO reflector led grow light series come with varying power ratings. You can pick wattage ranging from 240W, 480W, 720W, and maximum 960 watts. Each rectangular panel contains individual LEDs, with wavelengths ranging from 430nm to 730nm. This is not a full spectrum LED system with only 6 colors. IR is included, but it lacks UV. But there is a good balance between IR, red and blue lights. The 240-watt panel is ideal for a growing area of 2x2 feet. But I'll stick to the 480W model in case I need to upgrade my growing system. The lights can be placed at heights between 12 and 30 inches, depending on the growth phase for best results. As a more powerful LED grow light, the MARS HYDRO models come with dedicated cooling fans and heat sinks built into the panel to keep the hardware cool and safe. These lights have passed the US ETL certification for safety. The panels come with a power cord, and simple plug and play usage. User reviews indicate these LEDs perform satisfactorily with few noticeable issues. They are perfect for small grows and can work with a wide range of plant species. The build quality and materials used in this LEDs also deserve special mention. The lights work well for the veg stage, while performance may be mixed at the flowering stage for some species. Their product policy does not seem competitive compared with other led companies on the market with just 1-year warranty and 7 days product return. But with a fairly affordable price, buyers cannot ask for more. The panel has a rectangular shape and contains full spectrum LEDs. There are individual Epileds LED chips inside, each rated at 3W or 5W (depending on the model). With the 300W 1st gen model, out of the 100, 86 are red LEDs, with 10 for blue light, and two for IR and UV lights. At a standard 24 inch height, this panel can illuminate a growing area of 2x2 feet. Heat management is handled by two large fans and a large heatsink attached to the circuit board. The panel is sold with a long power cord and hangers. The 300W panel provides adequate lighting for smaller grows. These seem to offer excellent light for both vegetative as well as flowering stages. I would recommend the Roleadro 1st gen for its stability, and because I prefer 3W chips, which help improve light penetration for lower parts of plants. No switch for power control. 5-year warranty. 90-day product return. Advanced Platinum is a trusted brand in the LED light market, especially hydroponic growers, and cannabis community. Like all advanced led lights, the quiet fan lets these lights can run for a long period without getting heat. Their lights' size range from 150W to 1200W, which can be chosen to fit any size growers want. 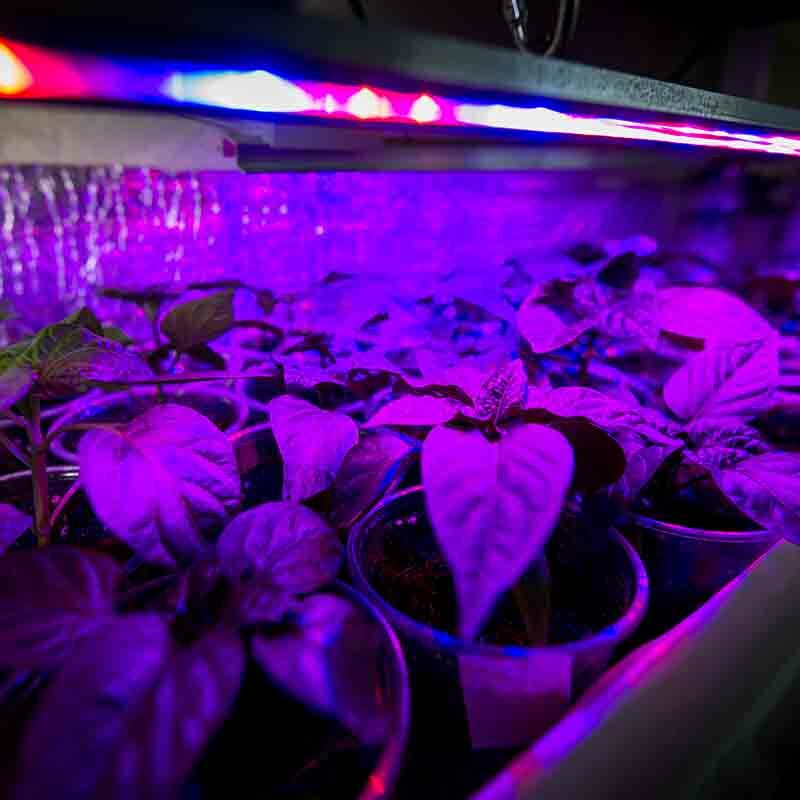 The products have a 12 band full spectral output out of the box, within the range from Ultraviolet to Infrared, which suits any phase of plant growth. There is a switch for users to turn on veg or bloom mode. As this led light brand is made in the USA, it seems to be far more expensive than the 4 products above. But they do offer some real values that buyers need to consider. Besides being well-made and durable, the products from this company help assure buyers with an excellent product policy - 5-year warranty and 90-day money back guarantee. This is not for those with a tight budget, so if you're looking for a solid build product that runs well for years, the Advanced Platinum series should be taken into consideration. More expensive than other brands. Kind LED has become a fairly popular brand on the grow light market. This is another high-end product on the led light market. This is one of the greatest spectra led lights on the market with 12 band-color spectrums ranging from UR to IR. The thick 2CM aluminum heat sinks help reduce heats and ensure the lights run effectively. They have two product types - the K3 and K5, in which the K3s own 3w diodes, while the K5 series has a mixture of 3 & 3w diodes. The K3 series is efficient to use for any indoor setup, grow tents, but it aims more at the small budget growers. The K5s are a more premium model. They are acclaimed to have improved power, intensity, and more advanced features. The company advertises for their advanced light technology like the secondary optical lens for deeper penetration, with the K5 series having integrated timers, remote controls, customizable features for the spectrum outputs, "mother earth" and light intensity. 3 years warranty 90-days product back guarantee gives a sense of safety for buyers, which is very appropriate for a product at the higher price end. The Led Lights from California Lightworks are no doubt a high-end model that will deliver the quality lights that get plants to work well at all stages. The SolarSystem has more power and comes with programmable spectrum control, which is better suited for large and commercial production. They have 5 bands of deep blue, blue, red, deep red, warm white, plus UV-B emitted by attached UVB T8 fluorescent bulbs. But they lack IR. Buyer's guarantee is excellent with a 3 year limited warranty and 90-day risk-free trial. The USA-made G8LED is another long-standing company in the led grow light market. It was awarded "Best LED Grow Light” by High Times Magazine in 2016, and 2017. G8LED uses 3-watt LEDs, which makes it easier to penetrate the plant lower parts. All of its products are packed with a fairly long spectrum of 8 colors, which is above average, and appropriate for all growth phase from vegetative to flowering period. The manufacturer offers a 2-year warranty and 90-day money back guarantee. This is fairly acceptable for most buyers in a fierce led grow light market. The panel does not have a veg/flower switch. This is why the company sells different products for different growing purposes and phases, including veg, bloom, veg/bloom. The model can be used with a coverage of up to 3x2' (240W model), 3x4'(450W model), 4x5 (600W model), and 4x6 (900W model). Any grower starter will find the Apollo Horticulture GL Series much budget-friendly but still enjoy some fair results. And in fact, the brand is fairly popular among indoor horticulture growers. They offer 8 different sized LED lights, ranging from 75W to 1200W. The wide spectrum of 6 colors, including the IR, is a plus for the Apollo Horticulture product. 2-year warranty policy is average enough on the market for buyers' sense of safety. One downside is that it doesn't have power on/off switch, or veg/bloom switch, but you may connect it with a timer to control your LED cycle better. A wide range of products fitting small-large grow needs. The list would not be complete without some sub-50W variants. The Deckey grow light is a dual spectrum panel made up of 225 individual LEDs. Of these 165 are red colored, while the rest (60) emit blue color light. They combine to provide the optimum level of light for plants at all stages. The panel is square shaped, measuring 12.2x12.2 inches. As the name suggests, the LED is designed to be hung from the ceiling. This Deckey LED is rated at under 10 watts. It can be kept at a distance between 1.6 feet to 3.2 feet. At the maximum distance, it should be able to cover 2.5 square meters or 26 square feet. The light is fabricated from high-quality plastics. You get a rather long 1.65-meter cable along with the light. Other mounting accessories are also provided along with the package. As for the actual performance, the Deckey is a very low powered grow light. It is not suitable for large flowering plants. Despite being stated by the seller as a full spectrum panel, it only displays blue and red colors and is not enough for all stages of plant growth. The Deckey is only perfect for the vegging or early growing phase though. The UNIFUN system is more powerful than the Dewey, with a wattage of 45 watts for the panel. And like the Dewey, this one is also a full spectrum system. The number of red LEDs stands at around 160, with about 55-56 blue LEDs. The added attraction is the presence of 8 special LEDs for UV and IR spectrum rays. The square panel measures roughly 12 square inches in size. The maximum wattage is 45, and the light can irradiate a maximum area of 1.5 square meters. The system has a straightforward plug and play system. As long as an outlet is close at hand, you don't have to worry about complicated wiring systems. The main advantage of the UNIFUN LED is that it can be used to grow a wide a variety of plants. They include both low light and high light varieties. But the 45-watt peak rating is too weak for the blooming or flowering stage of the plants. In the early seedling stage, this is a perfectly viable option according to expert feedback. The light system generates very little heat. It is also very easy to install as it comes with a dedicated hanger kit. LED technology is not something groundbreaking. It has been around for decades now. LED stands for “light emitting diode.” It is a small bulb that converts electricity into light energy. The history of LED lights stretches back all the way back to 1907. The earliest LED bulbs in the 1960s and ‘70s were costly and used only in advanced instruments. But in recent years, the costs have declined, and LEDs are used in everything from home lighting to consumer devices like TVs and mobile devices. It was only a matter of time before LED panels started appearing in the hydroponics and indoor grow scene as well. These days, LED grow lights are available in different sizes, intensities, and colors to suit various plant requirements. They are accessible for both small-scale as well as commercial productions. What are the advantages of LED grow lights over HIDs? Compared to incandescent lamps, LED bulbs and panels emit much less heat. This is very important for plants, as extra heat can damage your crop. Less heat also means that you can keep the lights much closer to the plants without fear of damage to the crop. That is one less factor to worry about when planning your grow system. Older incandescent lights are inefficient because a lot of the energy supplied is lost in the form of heat. But since LEDs emit less heat, less electricity is being wasted as well. If you supply the same amount of electricity to an LED and HID, the LED will provide more light. Typically, you can expect energy savings to the tune of 25-50% from LEDs. In indoor grow areas, space is a precious commodity. LED systems take much less room than HIDs, and are easier to move around and manage. Again, since they emit less heat, they also don't need extra cooling equipment, unlike older HID lamps. This means less clutter. LED grow systems these days are very flexible and can often be chained together. So you might even be able to reduce the mess of extra wiring. Plants require different light wavelengths during various stages in their light cycle. These days, LED lights are available in different wavelengths. Many LED grow light systems also come with the option of adjustable wavelengths (Full spectrum LED lights). By using specific wavelengths for plants at the correct stages, you can get maximum growth with minimal wastage of input energy. We all know about the fragility of incandescent bulbs. They have a propensity to burn out sooner or later. LEDs are a different breed altogether. As they produce less heat, the components have less chance of burning up. Modern LEDs often have a rated lifespan of tens of thousands of hours. So despite their higher cost, they are a more economical proposition in the long term. This is by no means a complete list. But we have done our best to hand-pick the best and proven LED lights for growing on the market. Whatever choices you make, we believe you'll enjoy large results with your indoor garden.